Seasoned to witnessing vast amounts of greenery when travelling in warmer climes, I’d never experienced an absence of tropical colours. So I was gripped by the view during landing. But even then I could spot some of the great things to do in Lanzarote. As we approached Lanzarote from the air, I was mesmerised by the dramatic volcanic peaks and lava fields which dominate the island and mentally put exploring this volcanic landscape on my list of “must dos”. It was a cold November day when we left London. So after disembarking our four-hour British Airways flight from Gatwick, I was itching to bask in the warm sunshine and explore every inch of this alluring, yet lunar-like, island. 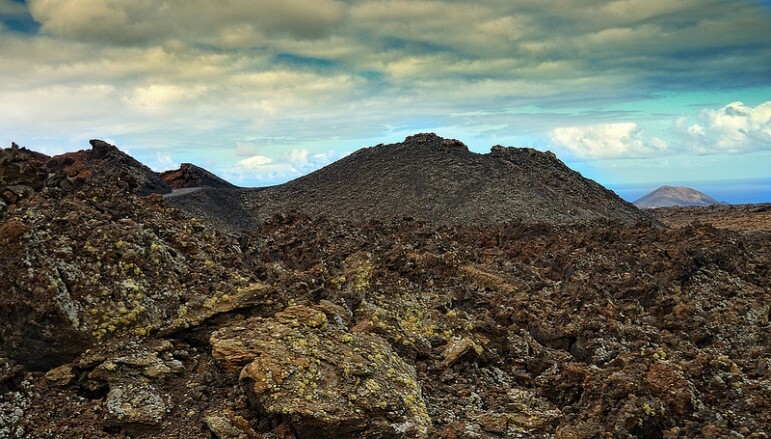 Known as The Island of 100 Volcanoes, Lanzarote, in the Canary Islands, owes its landscape to a series of devastating volcanic eruptions in the 1700s which destroyed villages and much of the island’s fertile land. Aside from its volcanic features and natural artistic creations, I was keen to see some of the other great attractions in Lanzarote. Thanks to its cosmopolitan marinas, one-of-a-kind experiences and stylish hotels – you’ll find plenty of sophistication mingling with Canarian charm. 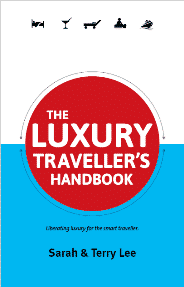 For me luxury is not just about the finer things in life, it’s also about real experiences. I wanted to get to grips with the history of Lanzarote, learn about its culture, and experience the unusual things that the island has to offer. Lanzarote more than surpassed my expectations. On our first morning we headed to Timanfaya National Park. 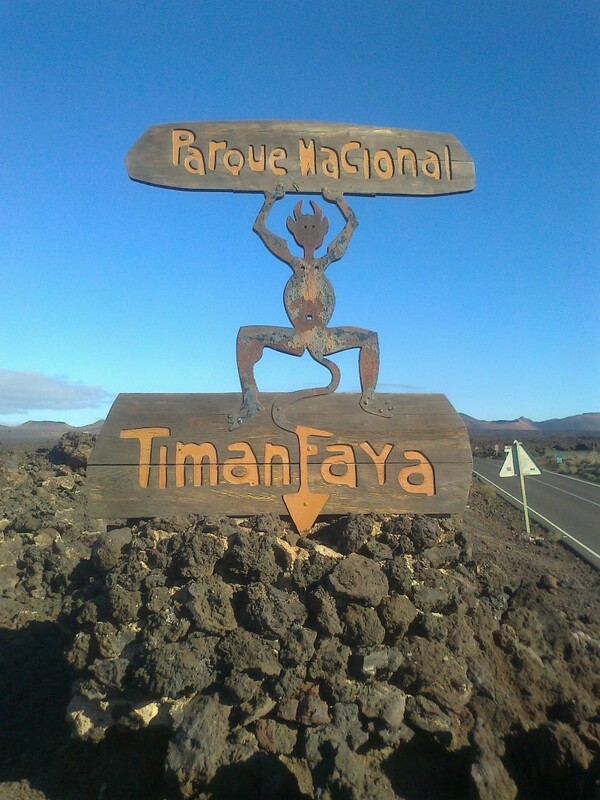 Spanning over 51km², Timanfaya reveals the true destructive power of nature. And due to the island’s low rainfall its barren landscape has remained largely unchanged for over 300 years. Journeying into the depths of this protected area, we were met by the devil – a symbol of Timanfaya National Park. The island’s early inhabitants believed Beelzebub was firing on all cylinders and caused Lanzarote’s most recent volcanic eruption and subsequent destruction. And as the long stretches of mountainous volcanos began to rise around us and I saw the work of a great power, a part of me began to believe in this too. 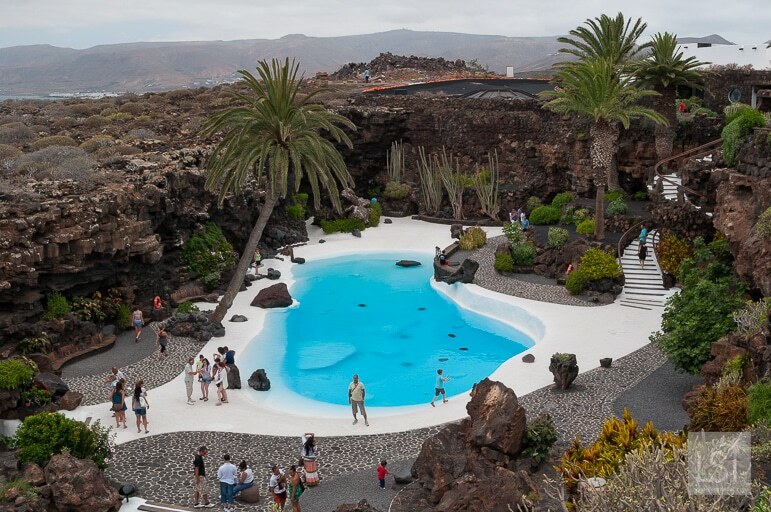 Fans of Lanzarote artist César Manrique will find one of his artworks gracing Timanfaya National Park – El Diablo – the park’s symbol harking back to the volcano’s devilish past. 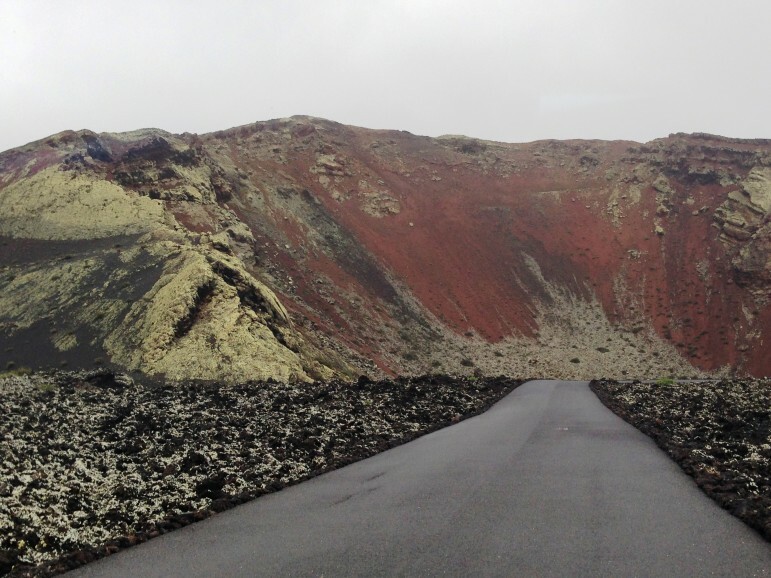 The 40 minute tour took us past some of the most important areas in Timanfaya National Park, including the underground laboratory which monitors the island’s volcanic activity. Driving through soaring valleys and collapsed lava tubes, we witnessed the sheer devastation of the once fertile land and came terrifyingly close to the edges of craggy cliffs. But my favourite moment was reaching the highest point in the park and staring into the distance. It was so isolated there it felt as though we were in another world. Heading back to the visitor centre we popped in to the restaurant there, also called El Diablo. Being a bit of a foodie, I’d heard about their unusual cooking methods, but I wasn’t prepared for what I found. The chefs at El Diablo create their dishes using a grill fuelled entirely by geothermal heat, which can reach temperatures of up to 600-degrees celsius, proving that maybe, just maybe, some good things can come from the devil’s work. 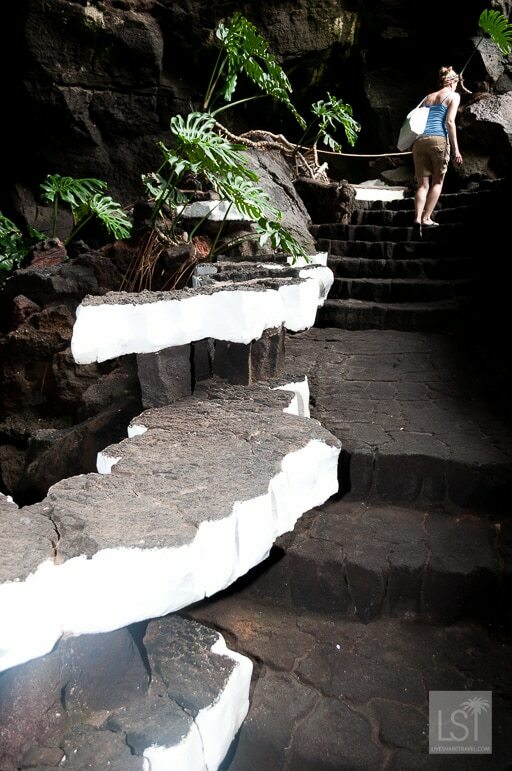 Lanzarote’s famed artist César Manrique’s works amount to far more than just the odd sculpture. Dedicated to fusing artistic design with natural elements and local traditions, many of Manrique’s creations can be found in public spaces across the island. 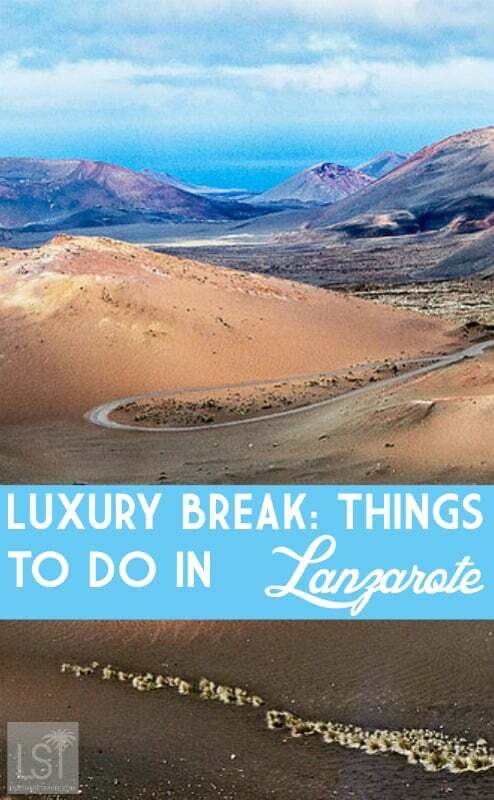 Each one amounts to a must see in Lanzarote. 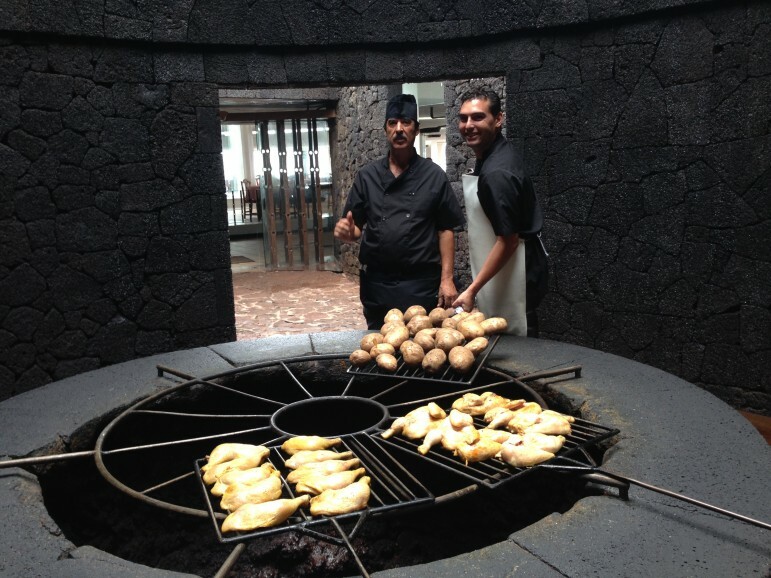 Jameos del Agua, in the north of the island, is no exception and perfectly reflects Manrique’s creative principles. 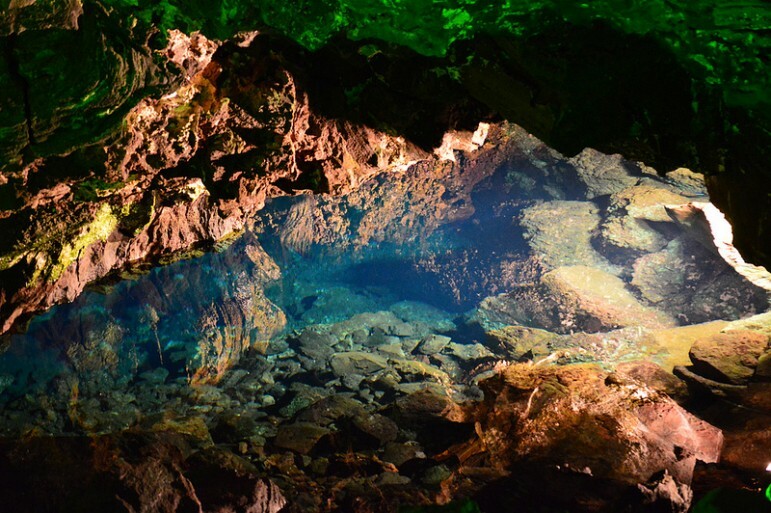 This natural attraction is part of the volcanic tunnel formed by the eruption of the La Corona volcano. As the roof of the lava tunnel collapsed, it created an open space better known as a ‘jameo’ and provided the attraction’s structure. Having viewed many of Manrique’s public artworks, I knew that my visit was going to be special but I couldn’t have predicted its sheer beauty. Descending a spiral staircase made from volcanic rock, there’s clever lighting illuminating the cave, soothing music and a calming atmosphere that makes it almost magical. Inside there’s perhaps the most romantic restaurant in the world, with a back-drop of craggy lava and natural plantations. But the further we explored Jameos del Agua, the more surprises we found. 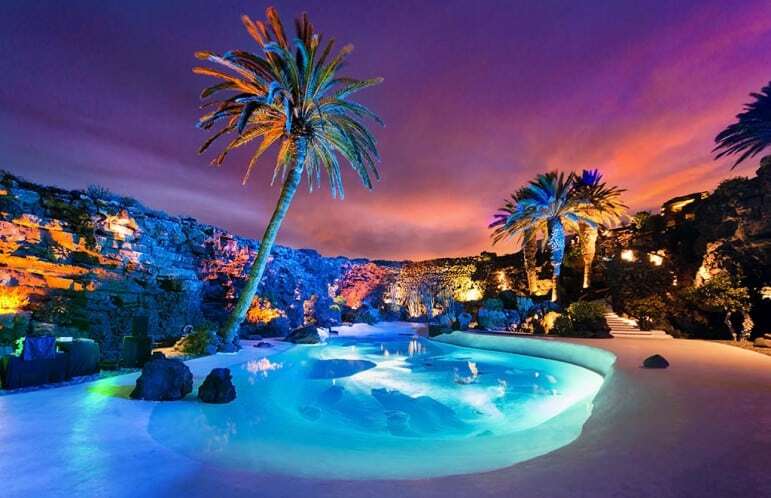 Nestled in the volcanic rock was a grand 600 seat auditorium with dramatic lighting, and a peaceful blue pool surrounded by Canarian palm trees in the fresh air of the larger jameo. Manrique’s blend of natural elements and art is breathtaking and I immediately understood why his work was so celebrated. 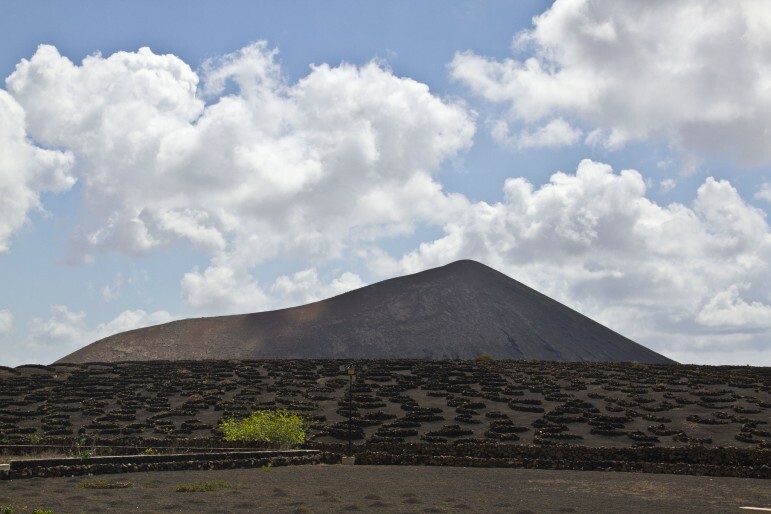 There’s also Casa de los Volcanes, a fascinating museum about volcanic activity in Lanzarote. I scurried off eager to learn more and found documents explaining local geology, interactive exhibits and live computers monitoring the island’s volcanos. But there’s a whole lot more to Jameos del Agua. Every Saturday evening visitors can enjoy dinner and a concert inside this volcanic creation, and I was invited to dine there too. And what an experience. The food was wonderful, the service impeccable. We enjoyed a three-course menu of Canarian dishes, using fresh produce from across the island. 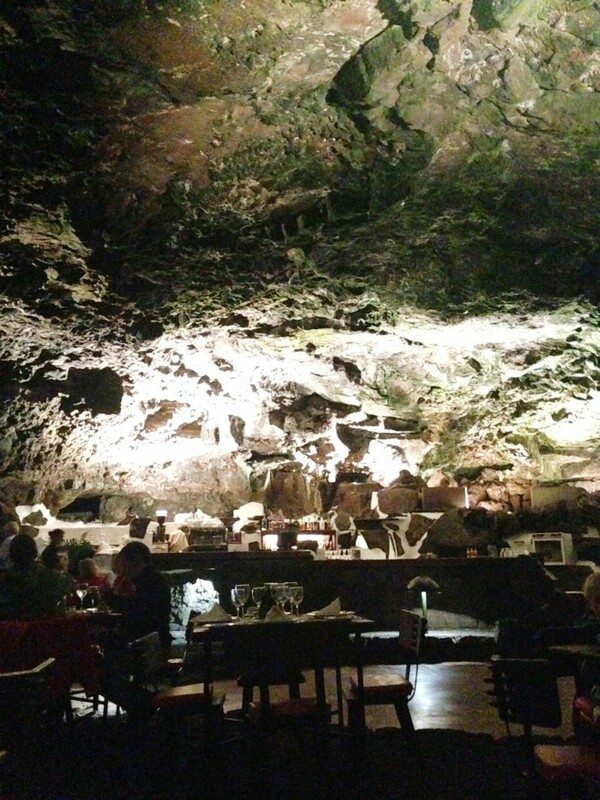 As we tucked into our main, chicken stuffed with mushrooms and Lanzarote vegetables, it was hard to believe we were sitting in a volcanic tunnel which once had molten lava running through it. After finishing my cortado (my coffee of choice on the island), it was time to enjoy the sounds of Toñín Corujo, one of Lanzarote’s most popular musicians. Corujo is famous for playing the timple – a traditional Canarian instrument. A mixture of a guitar and a ukulele, the upbeat local music kept the audience enthralled and it was clear to see the passion this band felt towards their music. 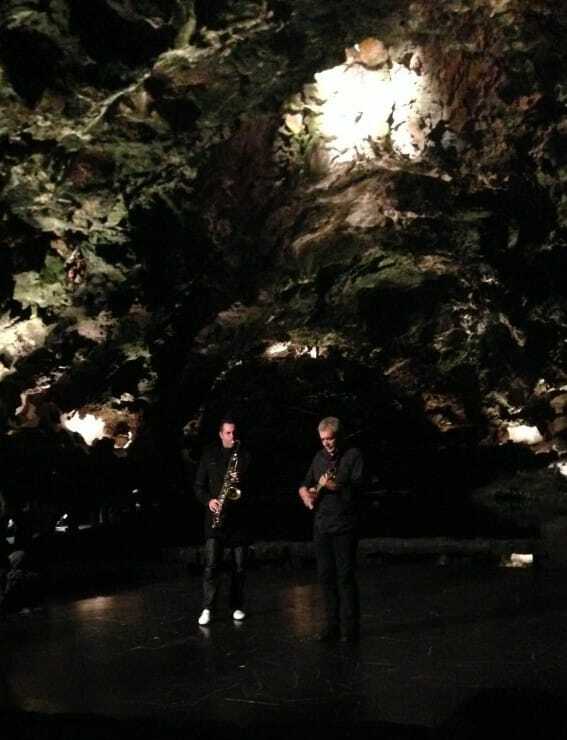 As the sound bounced from every surface of the cave, it created a truly unforgettable experience and I was sad as the performance came to an end. 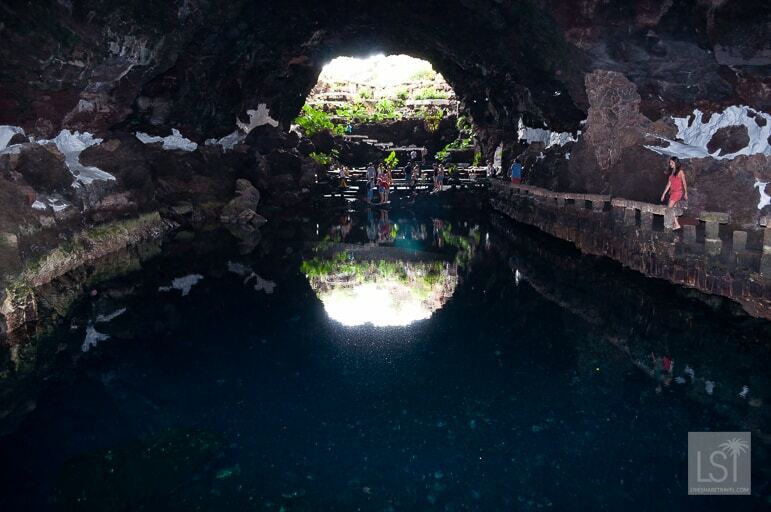 But Jameos del Agua isn’t the only place to explore Lanzarote’s volcanic caves. 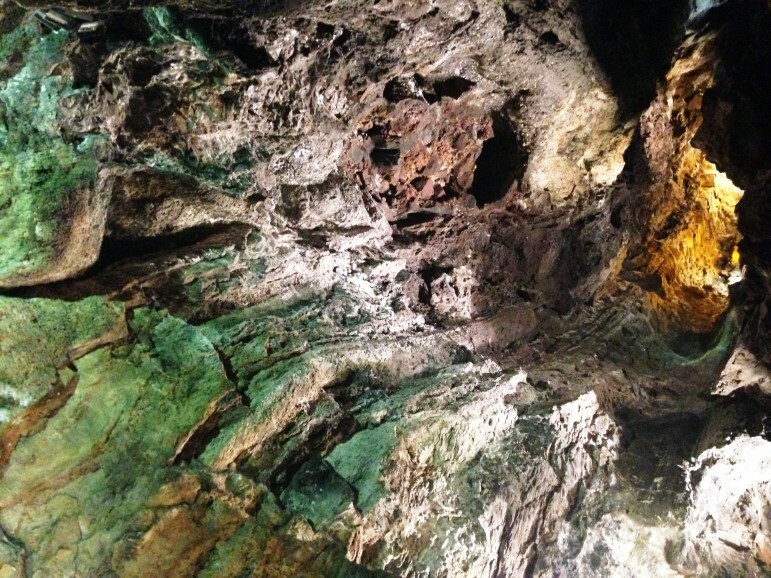 Just a short journey away is Cueva de los Verdes, or the green caves. Accompanied by a guide, you can descend deeper into the realms of the earth to further explore the tunnels of the Corona volcano. The next day we headed out into the Canarian sunshine, to learn all about Lanzarote’s famous wine culture. After spotting its arid terrain, I was intrigued to find out how Lanzarote could produce over two million litres of wine each year. As we drove to the La Geria region I wondered about lush vineyards and thriving greenery, but my expectations couldn’t have been further from reality. Visiting the La Geria region was an exciting and enriching experience. Thousands of black lava cinder holes protected by stone walls dominate the landscape. At first it appears to be some sort of strange art installation, but look closer and you’ll realise these are actually how the grapes for Lanzarote wine are grown. Due to the island’s minimal rainfall, the vines must be planted by hand two metres below ground and are then covered by tiny black volcanic stones called ‘picon’ to trap the humidity. The stone walls, better known as a ‘zoco’, allow the vines to be protected from the wind and give the grapes the best chance of survival. I was really taken by the dedication and painstaking labour that goes into producing Lanzarote’s wine. Just seeing La Geria is one of the best things to do in Lanzarote. But then there’s also tasting it. 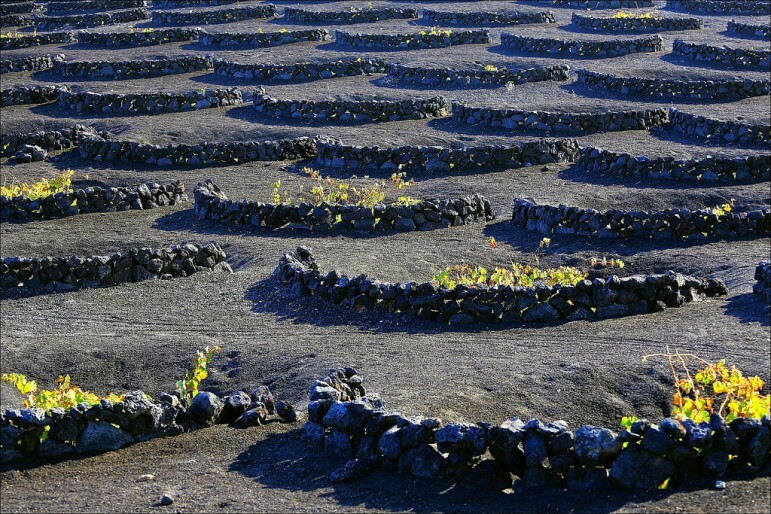 There are 18 commercial vineyards in Lanzarote, each producing a range of wines and offer tastings. To learn about one of the oldest wineries in the Canaries, be sure to visit Bodega El Grifo and Wine Museum for a fascinating experience. Of course after visiting La Geria, I was eager to enjoy some of Lanzarote’s wine for myself. 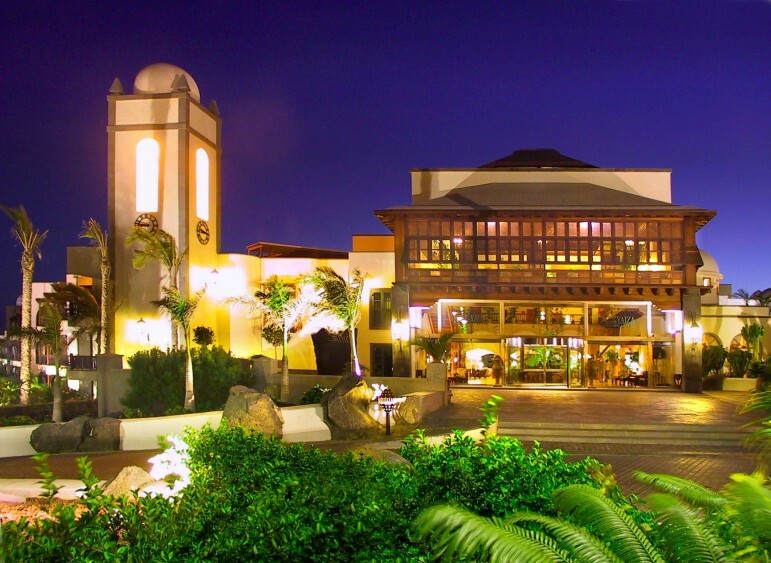 And on the island, there’s no better place to indulge than in the cosmopolitan surroundings of Puerto Calero. After choosing a table at a bar on the waterfront, I chose El Grifo’s Malvasia and it was one of the best I’ve ever tasted. It was not only sweet and refreshing but had a rich earthy flavour. After finishing a glass (or two), I went for a wander along the marina and stumbled upon an up-market shopping area. 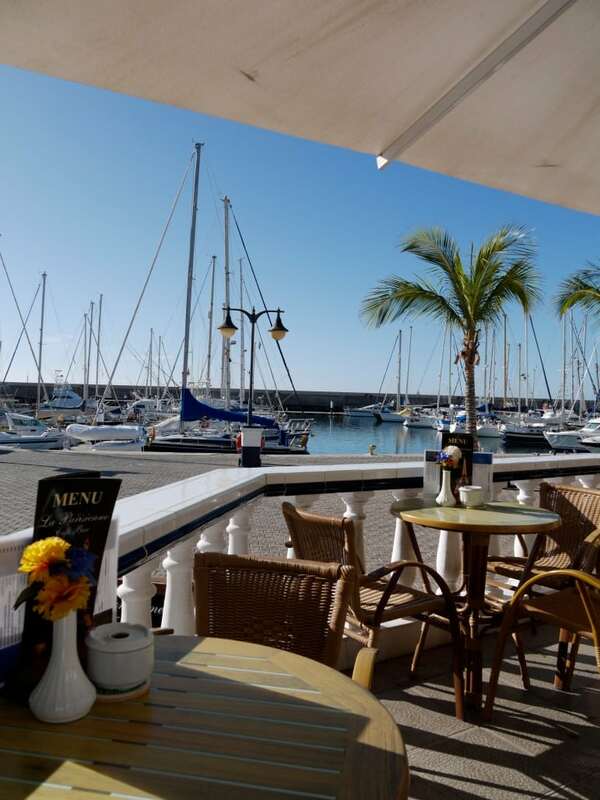 Puerto Calero is home to a small number of luxury labels including Tommy Hilfiger, Ralph Lauren and Hugo Boss, meaning you can stock up on plenty of luxury shopping before heading home. And when you’ve finished with the boutiques there’s plenty of good bars and sophisticated restaurants along the waterfront. But my favourite was Amura Restaurant, which is recommended by the Michelin guide as a Bib Gourmand restaurant – offering good food at moderate prices. 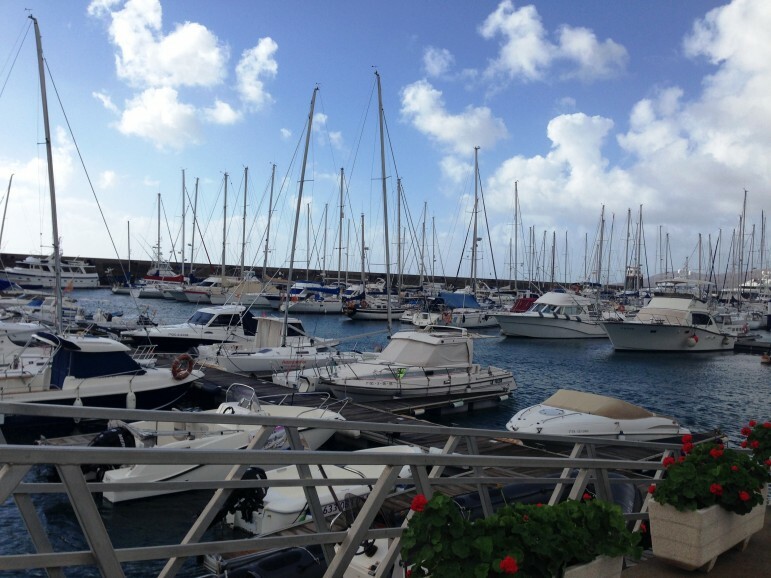 Puerto Calero is also a great place for keen yachters and has welcomed some of the world’s most luxurious boats. 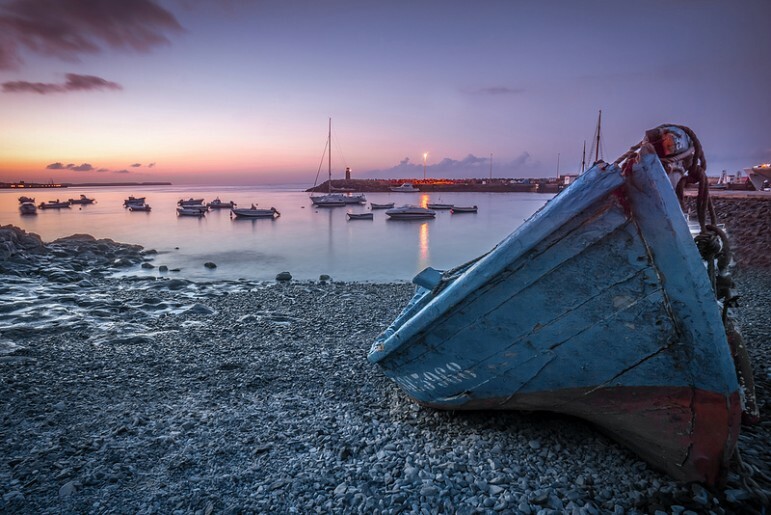 Located on the south west coast of Lanzarote, the harbour is sheltered from the island’s notorious winds and is just a 15 minute drive from Arrecife. 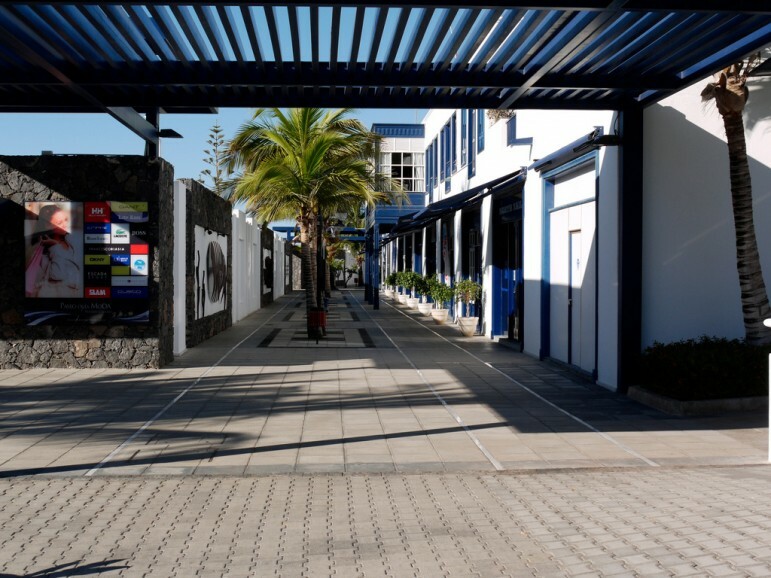 However, if you are planning to berth a boat on the island you’ll also find two other ports in Lanzarote, the newly-opened Marina Lanzarote and Rubicon Marina. After such a busy weekend exploring the island, I was happy to be staying at the Princesca Yaiza Suite Hotel in Playa Blanca. It’s known as one of the most lavish resorts on the island, boasting colonial-Canarian décor and an atmosphere that makes you feel very much at home. Overlooking the beach of Playa Dorado, it’s not only a sun-lover’s haven but also offers plenty in the way of luxury. 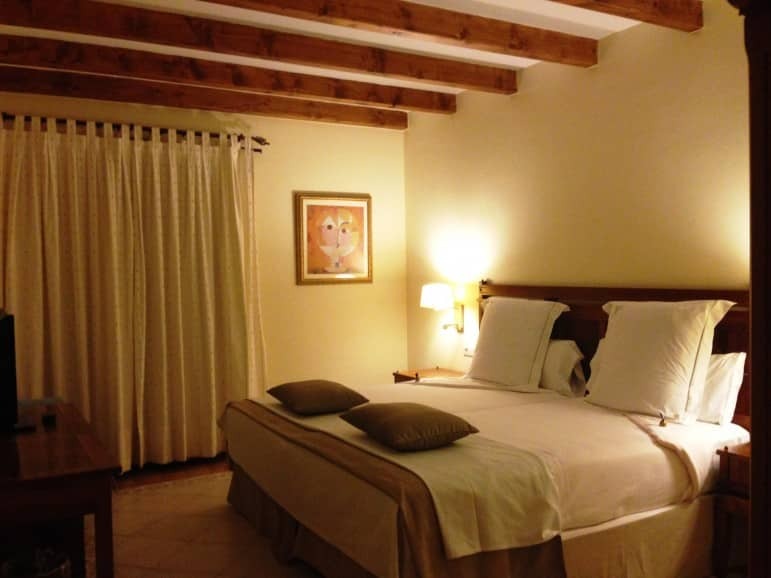 The hotel has 385 rooms which range from a comfortable double superior to the spectacular royal suite. I stayed in a traditional suite with a spacious bedroom, large bathroom and separate living room, which had excellent sea views. I loved the room’s beautiful presentation and thoughtful personal touches. Each evening I was greeted by a chocolate on my pillow and a note wishing me ‘Buenos Noches’. There are eight restaurants to choose from including a traditional Spanish bodega, a Japanese Teppanayki and a cosy Italian. But when I woke up with a ferocious hunger one morning, I was seduced by the Isla de Lobos – the Princesa Yaiza’s gourmet restaurant. I dined on a starter of Iberian Ham with fresh tomatoes, followed by a traditional Spanish breakfast and freshly-baked pastries. Not only does Isla de Lobos offer an extensive a la carte menu and impressive sea view, but it has also won an award for the Best Canarian Gastronomy. After finishing my delicious breakfast, I wandered off to my suite and promised myself that I would return for dinner. If you’re in need of some rest and relaxation, the Princesca Yaiza is also home to a Thalasso and Spa showcasing the therapeutic benefits of seawater. 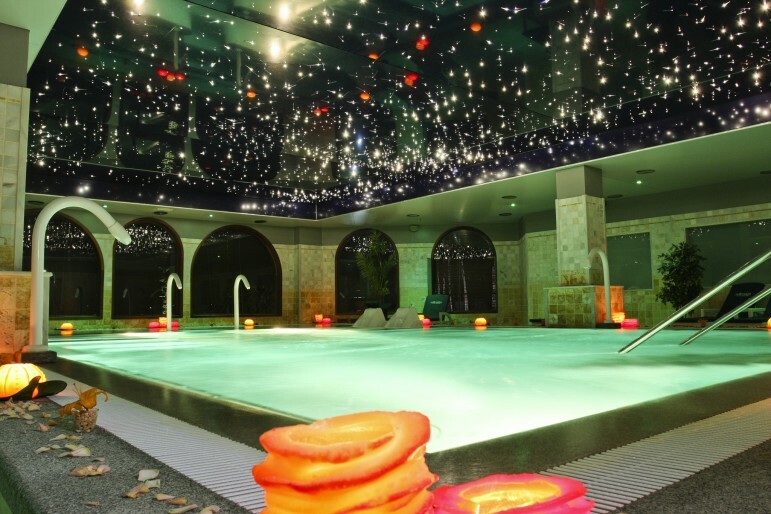 Here you can unwind in the heated saltwater pool, making the most of its underwater music, hydro-massage jets and dazzling starred ceiling. There’s also relaxation rooms, saunas, a Turkish bath, and a wide range of luxury treatments. As I wandered around the award-winning hotel, it became clear why it is so loved by visitors. From the 4 Lunas bar and boutique shopping arcade, to the outdoor local artisan’s market and personalised check-in with a welcoming glass of cava, The Princesca Yaiza offers guests a wealth of luxury. As my visit to Lanzarote drew to a close, I realised the impact that this mysterious land had had upon me. Each of these things to do in Lanzarote gave me an insight into the turbulent history of the island, revealed a host of unusual sides to its character and the Canarian charm captured my heart. I can’t wait until the day that Lanzarote and I meet again. Such a beautiful island! After living in Tenerife for 6 months, I always kick myself for not visiting the other islands in the Canaries. Hopefully I’ll have the chance to visit Lanzarote some time soon.